darthmaz314's Disney Snapshot of the Day today introduces another new feature called "Flashback Friday." This feature will highlight moments from Disney gone by, including attractions that are no longer operating and all things of Disney World past. 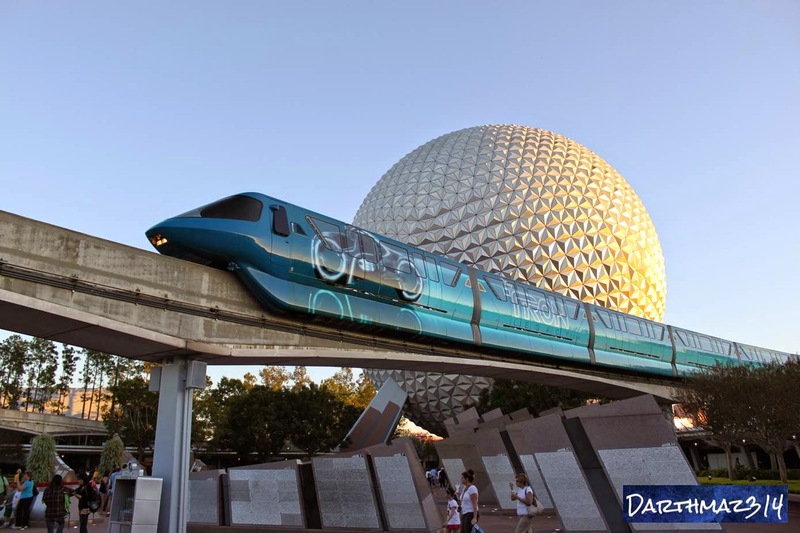 Our first post highlights Disney's fairly new advertising method of promoting their big movie release for a particular year by installing a "wrap" over one of the operating monorails. In short, one of the monorails is shrink wrapped in a billboard, basically turning it into a mobile advertisement for a major Disney release. Featured today is the Tron Legacy monorail which could be seen trolling through Disney property back in 2010. Captured here as it crosses in front of the majestically massive Spaceship Earth, the Tron monorail, much like interest in its movie namesake, did not last very long.